Obturator internus hematoma is very rare but very important entity to recognise as it may mimic myositis or abscess around hip joint. Failing to recognize it and treating patient surgically may lead to untoward consequences. Case Report | Volume 5 | Issue 4 | JOCR Oct-Dec 2015 | Page 71-72| Varun Chouhan, Alok Mandliya , Kiran Chouhan. DOI: 10.13107/jocr.2250-0685.351 . Department of Orthopaedic, Bombay Hospital, Ring road, Indore. India. Department of Neurology, Bombay Hospital, Ring road, Indore. India. Department of Radiology, Bombay Hospital, Ring road, Indore. India. 10 Patrakar colony, 103 Anuj apartment, Indore (M.P). India. Introduction: Obturator internus hematoma(OIH) is a very rare entity. In past it has been reported in hemophilics, we firstly report obturator internus hematoma in a patient of stroke on antiplatelet drugs. Obturator internus hematoma can cause severe hip pain with normal X-rays, so it should kept in differential diagnosis of hip pain with normal radiographs. Case report: 74 year old male with history of recent onset stroke presented to us with left side weakness and left hip pain. Radiographs were normal. MRI revealed left obturator internus hematoma. Patient was treated conservatively by stopping antiplatelet medications. Conclusion: Obturator internus hematoma is very rare but very important entity to recognise as it may mimic myositis or abscess around hip joint. Failing to recognize it and treating patient surgically may lead to untoward consequences. Keywords: Obturator internus hematoma, antiplatelet drugs, muscle abcess, Obturator internus. Obturater internus hematoma is a very rare entity. In the past it has been reported in hemophillics, we firstly report obturator internus hematoma in a patient of stroke on antiplatelet drugs. Obturator internus hematoma can cause severe hip pain with normal X-rays, so it should kept in differential diagnoses of hip pain with normal radiographs. A 74 years old male with past history of hypertension and left PCA infarct on ecosprin had acute onset weakness of left half of body (LL>UL) without headache, vomiting, seizures. He was evaluated outside and found to have infarct in right ACA territory. On admission to our hospital he was found to have left hip pain. He was not able to walk due to pain. On examination, left hip movements were painful especially rotations. 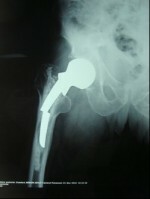 Right hip was normal. X-rays of both joints were normal. MRI of both hip joints revealed acute onset hematoma in left obturatorinternusmuscle [Fig.1]. It was treated conservatively by stopping antiplatelet medication and it responded well. Later, antiplatelet medicine (ecosprin 150mg) was started again once his pain resolved. His relevant blood investigations are Hb 12.5 gm/dl, TLC 7400/cumm, Platelets 2.95 lacs/cumm, ESR 35,PT-INR 1.00,APTT 37.80 seconds(Control 38.90 seconds). The obturatorinternus  muscle originates on the medial surface of the obturator membrane, the ischium near the membrane, and the rim of the pubis. It exits the pelvic cavity through the lesser sciatic foramen. The obturatorinternus is situated partly within the lesser pelvis, and partly at the back of the hip-joint. The nerve supplying this muscle is a branch from the sacral plexus, named the nerve to obturatorinternus (L5 to S2). The blood supply comes from the internal pudendal vessels and superior inferior gluteal arteries. It functions to help rotate femur laterally with hip extension and abduct femur with hip flexion, as well as to steady the femoral head in the acetabulum. Obturatorinternus hematoma (OIH) has only been reported in hemophillics . Other most often reported cases are primary pyomyositis [3,4] or posttraumatic haematomas occurring during pelvic fractures. No case of spontaneous hematoma due to antiplatelet drugs has been reported to best of our knowledge. 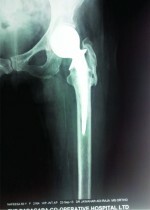 This case is very important as so many patients are on antiplatelet drugs and many of them may have hip pain, especially older patients may have hip pain which may attributed to arthritis, osteoporosis, related back unless properly investigated. As in OIH, X rays are normal and diagnosis can be confirmed on MRI. All patients with hip pain with normal radiographs on antiplatelet medications should be investigated with MRI if OIH is clinically suspected. OIH should be differentiated from muscle abscess as later will require surgery in the form of drainage of abscess while OIH due to antiplatelet drugs can be treated conservatively by just stopping the medication. Obturatorinternus hematoma is very rare but very important entity to recognise as it may mimic myositis or abscess around hip joint. Failing to recognize it and treating patient surgically may lead to untoward consequences.So, all patients with hip pain with normal radiographs on antiplatelet medications should be investigated with MRI if OIH is clinically suspected. Obturatorinternus hematoma is very rare but very important cause of hip pain in patients on antiplatelet drugs and MRI should always be done in such cases. 1. Aouba A, Breton S, Harroche A, Sy-Bah D, Torchet MF, Frenzel L et al. Spontaneous obturatorinternus muscle haematoma: a new unpublished cause of ilioipelvic pain in haemophilia. Haemophilia 2013 Jan;19(1):157-60. 4. Papadopoulos M, Chugh S, Fitzgerald R, Thomas RJ: Obturatorinternuspyomyositis.